Typhoons and Trump tariffs: multiple storms are raging around Macau’s gaming industry and forecasters are starting to add up what it will mean to the industry’s bottom line. Japanese financial firm Nomura revised an earlier prediction of 15 percent gross gaming revenue (GGR) for the month of September, reducing it to 10 percent due to a shutdown of Macau’s casinos because of Typhoon Mangkhut. All of Macau’s casinos were ordered shuttered for 33 hours over the weekend. 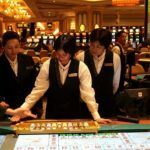 Earlier this year, the issue was brought to the attention of Macau’s government after casino workers protested having to work during last year’s Typhoon Hato. That led to a bill proposal to allow the government to shut down casino operations in times of crisis. 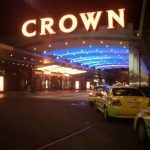 The city’s gaming venues have since reopened, but lost nearly $185 million in less than two days of being closed by the storm. Financial firm Sanford C. Bernstein Ltd. also tempered its September expectations for Macau, projecting a three percent growth in GGR rather than the previous eight to 11 percent growth forecast. The damage done by the typhoon is on top of news this week that falls in line with a warning Nomura issued in July, when the analyst first reduced its yearly GGR projections in Macau. On Monday, the US announced a 10 percent tariff — which will increase to 25 percent on January 1 — on $200 billion worth of Chinese goods. On Tuesday, China retaliated by announcing tariffs on $60 billion of American goods. Nomura reduced yearly GGR projections in Macau from 14 down to nine percent in July, saying the trade dispute between the two countries could further reduce Macau’s junkets and possibly lower the pay of China’s middle class – leading to less expendable income. 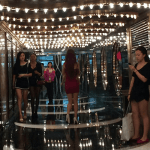 Junket groups usher high-spending gamblers into Macau casinos. 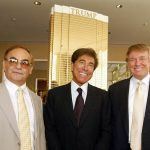 During their heyday, 80 percent of GGR in revenue came from five percent of its gamblers, financial media site Benzinga reported. But VIP junkets have been the subject of government regulation and scrutiny in recent years and have been increasingly losing market share. Now, tariffs imposed by the Trump Administration could exacerbate their decline. The reduction in middle class gamblers, however, might not be as easy to predict. Despite the new projections, the firms are still predicting year-over-year GGR growth in Macau. If Nomura is right about Trump’s tariff’s impacting China’s middle class gambling habits, it would fly in the face of what appears to be the current trend. The Macau Statistics and Census Service reported that visitors to Macau have increased in the first six months of the year by eight percent over 2017. That comes while casinos have shifted their marketing focus by appealing to middle-class gamblers, rather than VIP junkets. That shift, as well as fewer travel restrictions, led to a 13 percent increase of visitors to Macau from mainland China. Nomura also reduced its 2018 GGR projection in June, which saw Macau casinos enjoy a 12.5 percent increase over 2017 and was the 23rd consecutive profitable month for the industry. The market has already factored in negative news. On the positive side a deal maybe reached with both sides avoiding conflict with both making last minute concessions with respect o Trump. While the typhoon was a shock, overall little real damage occurred . So the minor slowdown of a 33 hour shutdown occurred, the losses were reduced with an organized strategy. Many casinos were at full occupancy even though the gambling was shut down. No comment from any insurance company of major damage to casino architecture and construction. A 33 hour shutdown is a minor hiccup. Casino stocks fell and are a buying opportunity. If you can hold for 6 to 12 months.